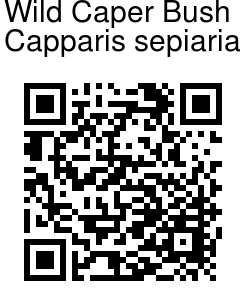 Wild Caper Bush is a spreading or climbing, much branched shrub, 3-4 m long, more or less velvet-hairy with ashy grey simple hairs. Leaves elliptic oblong to ovate or nearly round, 1.5-4 cm long, 1-2 cm broad, often retuse, softly velvet-hairy to hairless; leaf-stalk 2-5 mm long, velvet-hairy; stipular spines 2-5 mm, hooked, often brown-black. Flowers usually in corymbose at branch-ends clusters of 10-30, small, 5-10 mm across, white; flower-stalks 1-2 cm long, not thickened in fruit, velvet-hairy. Sepals 3-6 mm long, 2.5-3.5 mm broad, subequal. Petals oblong-spoon-shaped, 3.5-8 mm long, 2-3 mm broad, more or less hairy at the base. Stamens many, 5-10 mm long. Gynophore 6-10 mm long, slightly thickened in fruit. Fruit spherical, 8-12 mm in diam., crustaceous, dark-brown, smooth, 1-2 seeded; seed about 6 mm. 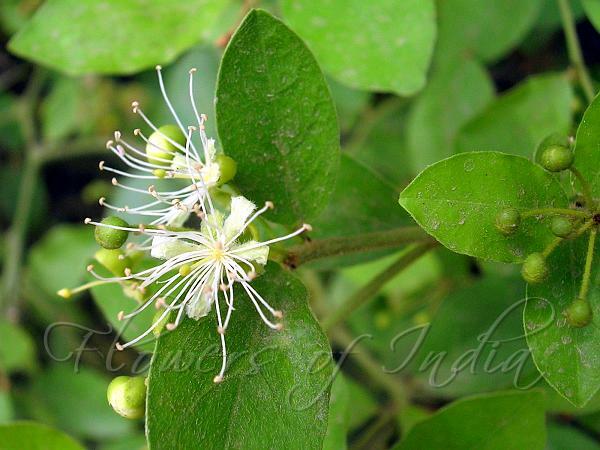 Wild Caper Bush is found in India, Ceylon, E. Pakistan, Malesia, Indochina, China, Australia and tropical Africa. Identification credit: Navendu Pagé Photographed in Garden of Five Senses, Delhi.